My son's school's Halloween party was last night, and weeks ago I had promised him that I'd show up as a "robot mama" for the big event. But how to deliver? I still had the from last year, so I figured that would make a good robot body base … but I really, really wanted to have flashing lights. What's a robot without flashing lights? A quick trip to the party store and I had eight flashing lights: three of those newfangled " ", and five safety flashers (and some mylar ribbon, which was an impulse purchase). I traced the lenses of the pumpkin lights to make a template, and used the template to space the holes I wanted to cut in the box. I duct-taped the flashers to the inside of the box; the little safety lights had clips, so I hung those on bits of wire that I threaded through the box and twist-tied on the inside. Here's the end result — my first-ever Dress A Day video (hard to get the effect of the flashing lights in a still image!). The audio (which is NOT essential, so feel free to turn those speakers down) is me giving instructions to my long-suffering cameraman, Mr. DressADay. The green deelyboppers on my head? A last-minute addition; I keep them in the trunk of my car, "for emergencies". 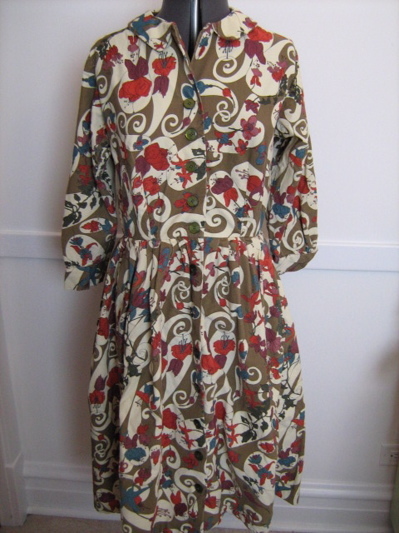 Wundermary sent me this link (from the ) and it's a fantastic airship-hostess dress. 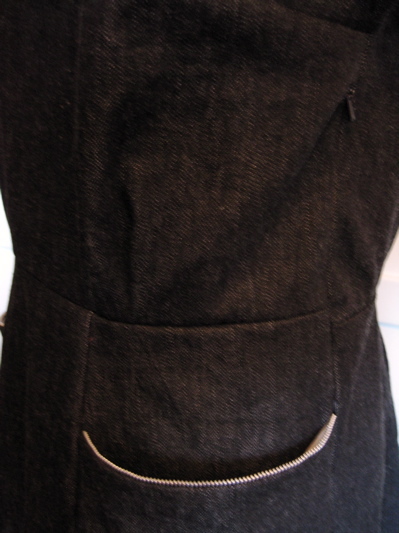 I love the asymmetry, especially the pocket. 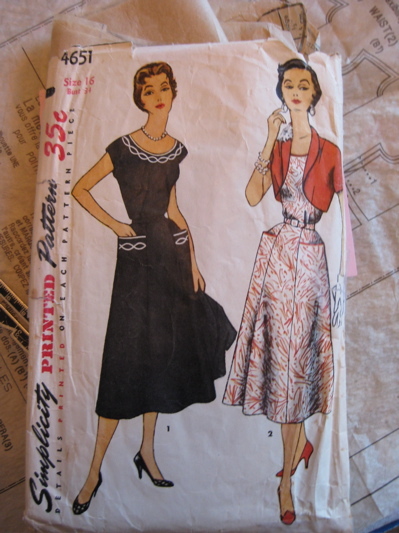 And, as you can see on the pattern, my supervisor's name is very likely to be "Betty Smith." Oh, and some sale info for you: first of all, Jen is running an "Only Hours Long" sale at that will end at the witching hour of midnight EST on Halloween Friday, October 31, 2008. Save 25% off any order starting *right now* … but the code will vanish into the mist as the clock strikes 12 a.m. Coupon code will be 'bewitched'. Also, Sandra at is running a special Halloween sale, 15% off excluding shipping, starting TODAY October 29th and running through October 31st. Just mention "Halloween15" in your notes. Sandra is also looking for her 700th sale and a special bonus will be going out to the lucky 700th buyer … and I think would make an excellent 700th sale! So a couple weeks ago I went roller-skating, on the spur of the moment, in [location redacted]. I went straight from work, so (as is my wont) I was wearing a full skirt and a cardigan sweater. I get my skates (rentals, and they carved up my ankles something tragic, I'm still sporting band-aids), lace 'em up, and am about to hit the floor, when this Creepy Guy intercepts me. "I am so sorry for coming up to you like this," said Creepy Guy, and for a minute I thought he meant "on Rollerblades," because, as you all know, I am an old-school quad-skate SNOB, but no — he continued — "I just had to say how BRAVE you are. I've never seen anyone skate in a skirt!" I was, of course, gobsmacked (as I always am when people are bogglesomely rude and/or clueless), but all I could think of to say was "What do you think people did before 1955?" and fix him with my best Withering Look before I skated away. First of all, skating in a skirt is not "brave". Rescuing children from burning buildings is brave; wearing a skirt is … wearing a skirt. So Creepy Guy (who was also wearing one of those arm holders for his iPod, which ALSO pissed me off, because if you are skating at a rink you should do the DJ the courtesy of listening to what he's spinning, even if he IS making Slurpees at the snack bar at the same time) was calling me brave because — as far as I could tell — there was a chance I might FALL and THUS: someone might, possibly, theoretically SEE MY UNDERWEAR. C'mon, people, are we all six years old? Let us first admit that all of us know that most people wear underwear. We know this because when people do NOT wear underwear, it is a cause for comment. There are slang terms ("Going commando," etc.) for not wearing underwear; I have not heard any for wearing underwear. Thus not wearing underwear is the marked case. Let us next admit that most people wear underwear that is, at minimum, the same coverage as a relatively modest bathing suit. How do we know this? A quick investigation of any mass-market store (e.g. Target) shows that the ratio of "bikini," "hipster," or "brief" styles of women's underwear stocked is roughly double the amount of thong underwear stocked (by number, not volume, obviously). Retailers stock items in proportion to their sales. We also know that these things exist: boy shorts, bike shorts, "shapers" etc., etc. So there are many more types of underwear that do not allow for indecent exposure than there are those that DO. NOT TO MENTION (as I mention it) that a SIGNIFICANT portion of the women skating in jeans were displaying a "whale tail," which is (as I'm sure you know) the phenomenon where a large portion of the back and sides of a pair of thong underwear is visible above the back waistband of a pair of pants (usually low-riding jeans). And more than a few of the male patrons had visible boxer-shorts waistbands displayed above the waistbands of their pants. Given all this, then, could we please lay off the "OMG!!!! Someone might SEE YOUR UNDERWEAR!!!" hand-wringing directed at us skirt- and dress-wearers? I know it's too much to ask the Creepy Guys of the world to cut it out (because if they were self-aware enough to know not to say stuff like this they would not, in fact, be creepy), but, seriously, people. We can wear skirts and dresses and participate in all sorts of normal activities, such as climbing up stepladders, crawling under desks to swap cables, riding bicycles, carrying boxes (up to 70 lbs), and, yes, even go roller-skating. So, didja miss me? Sorry to be AWOL for most of last week — I was at , and Pop!Tech is the kind of conference that is so engrossing you forget about the entire outside world, including your sadly neglected blog. I talked for five minutes (and possibly some seconds over, although nobody would tell me how many). One of the about Pop!Tech is that they have a real live artist interpreting all the talks … Peter Durand, from . Cool, huh? I think the artist really rose to the occasion — and remember, I spoke for FIVE MINUTES, so he had just that long to do this picture in! With any luck this week we will return to our regularly scheduled dress blogging. Also: I'm working on a rant about underwear: do you guys want to read it? 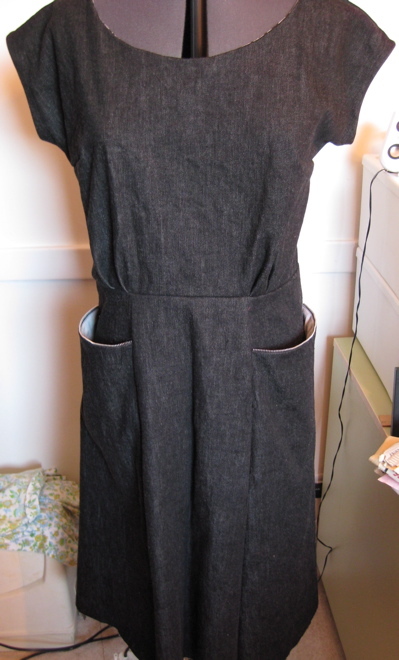 Unfortunately, the neck is too low, and the soft pleats, when made in denim, stick out in a bunchy and annoying way. I'm calling this an interesting failure, because, well, when you get right down to it, all failures are interesting. I love to know the "why" when things go wrong. 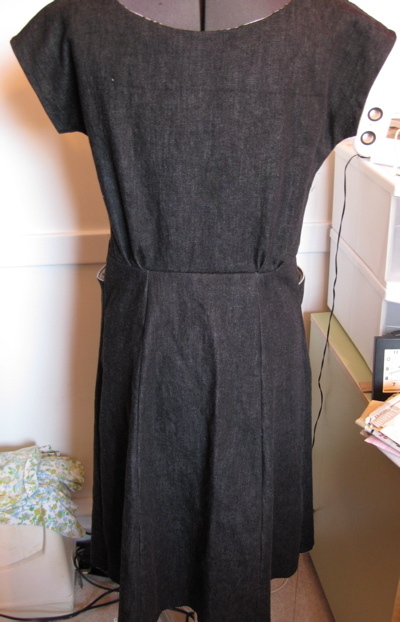 This dress *should* have been a success: pockets, black denim, scoop neck, zippers … no construction issues, no fitting issues … and yet, when I tried it on, I went "Ugh!" The facts: My name is Tina Sutherland, I'm a 52 year old former RN, current grandmother and married to a lucky guy. 😉 I own . (I'm one of the several pattern sellers at .) 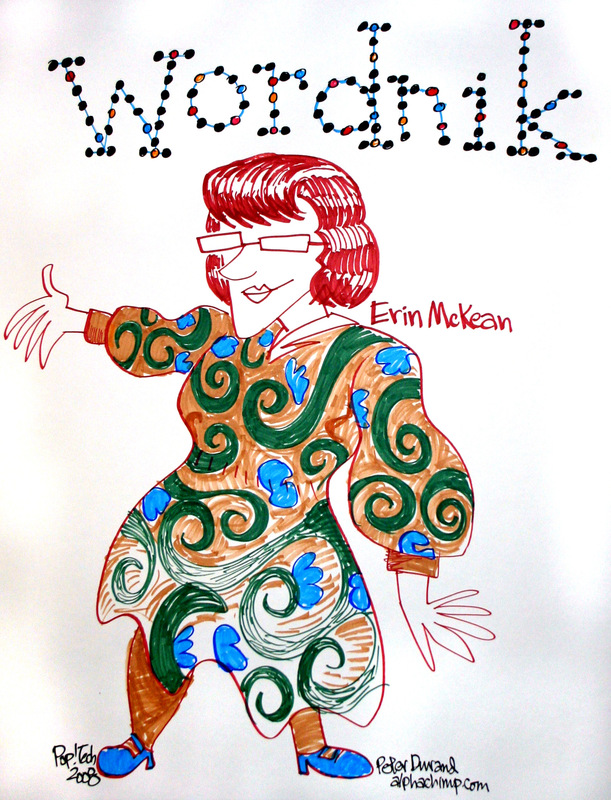 I have been selling patterns for about three years, selling online for 10 years. What's the weirdest/best/craziest/most beautiful thing you've ever found? The best thing I have found is and I have a (warning! 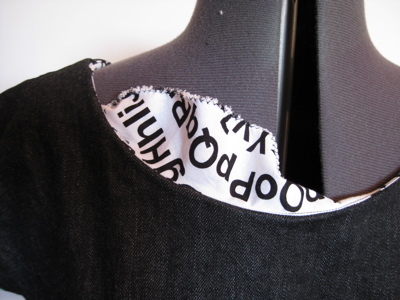 FAKE POCKETS! —Ed.) that hasn't sold (but I admit I'll be sad when it goes!). It's a good day at work when … A good day is when somebody discovers the long lost pattern they have been looking for. They are so happy and send such nice notes. A bride finding her exact dress is exciting too. Even when it's a ! The blogs I read (other than ADAD are …) Of course MilitaryHumveeAuction! Then Lisa, AKA Miss Helene writes and I'd add … it's a treat! This year's Blog Action Day topic is "poverty" — and usually, when we think of poverty, we've been conditioned to think poverty is a problem Someplace Else, someplace far away, where we see news reports of barefoot children and people lined up with begging bowls. But, of course, people are poor everywhere (some people in our own neighborhoods are poorer today than they've ever been). And so one of my favorite charities has always been the . It's hard to be hungry — and harder still to be hungry in a country where there's fast food on every block, sugary drinks advertised on every billboard, and where an apple can cost more than a hamburger. If you want to help your neighbors get enough to eat, please do consider making a donation to your or food pantry. Rita at is updating her site, and wants to know what you think of the recent changes. If you make a useful suggestion, she'll offer you a 20% off coupon! And then you can send your savings to the food bank, and everyone's happy!